This PowerBASIC 32-bit version has been totaly reworked to match the C++ 64-bit version as close as possible. All the tedious mousing code is handled by GDImage. State of the art anti-aliasing. 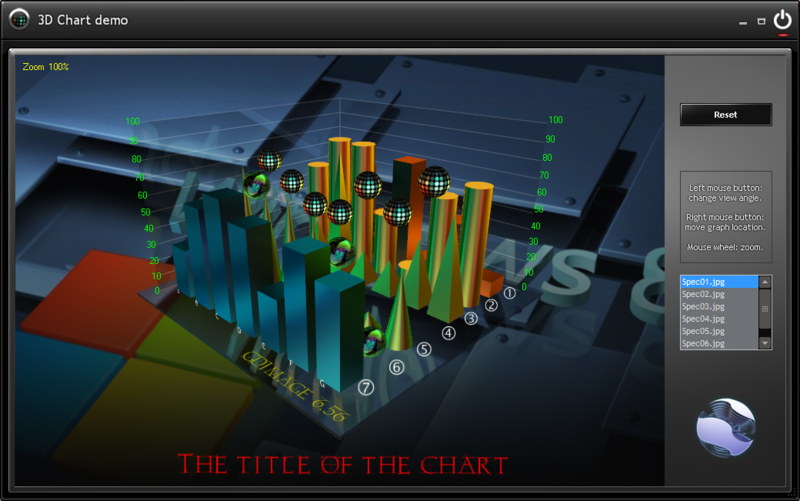 You can create state of the art Chart labels, using any TrueType font on the fly. The GDImage built-in specular mode is able to render surfaces with true glass effect. Chart primitives: bar, cylinder, pyramide, torus, sphere, disk, cube, cone, cup, dome, band, line. The primitives do not use GLUT quadric, but pure low level OpenGL coding. You can change the texture background on the fly, and select a new one from the listbox. When do you make your first YOUTUBE Video with this Patrice? I imagine a "Flyaround" with this Grafik. that is the exact transcription of the C++ 64-bit version that has been posted here.